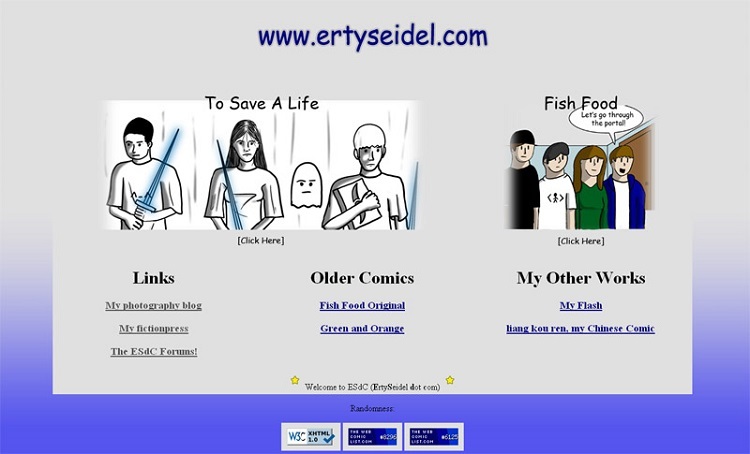 I created the first version of erty.me, at the time called ertyseidel.com, sometime around 2000, as a project for my class - a website about riparian areas. Everyone was very impressed that I had a website. My dad helped me set up the domain name since I was only nine years old at the time. Comic Sans was my favorite font at the time. Because I liked comics. A few years later, I learned some HTML on my own and built a new version. Already at the time I knew that Firefox was superior to Internet Explorer. After a while, I decided that I wanted to publish my comic, "Fish Food", online. Also included on the site were a "treasure hunt" and a list of videogames I owned, along with reviews. In late 2006, I changed my site once again. 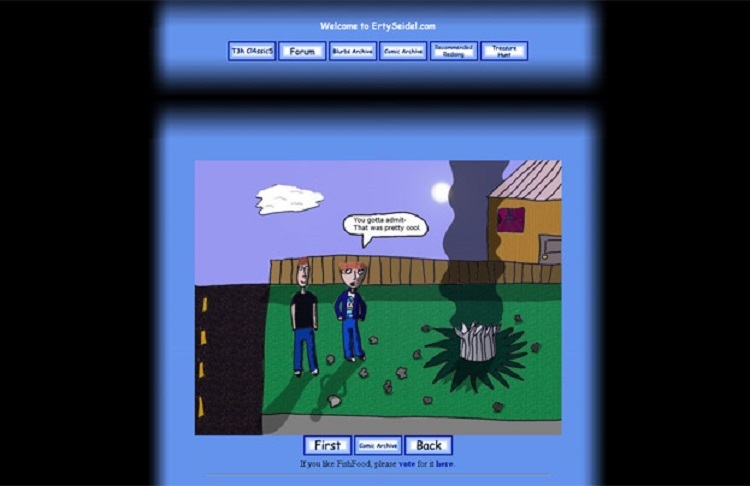 By now I knew some basic CSS, and the site was dedicated to webcomics almost entirely. Sometime in 2007 (probably July, when I started To Save a Live), my website changed again. Favoring simplicity, this grey-blue box adorned my homepage for some time. To Save A Live was an infinite-canvas comic experiment, written between July 2007 and November 2008. When I finished To Save a Life, I updated my homepage once again. In April 2009, I discovered skeuomorphism, and also abandoned the Comic Sans motif that I'd used since for nine years. 2011 brought a super minimalistic design with a lot of white space. 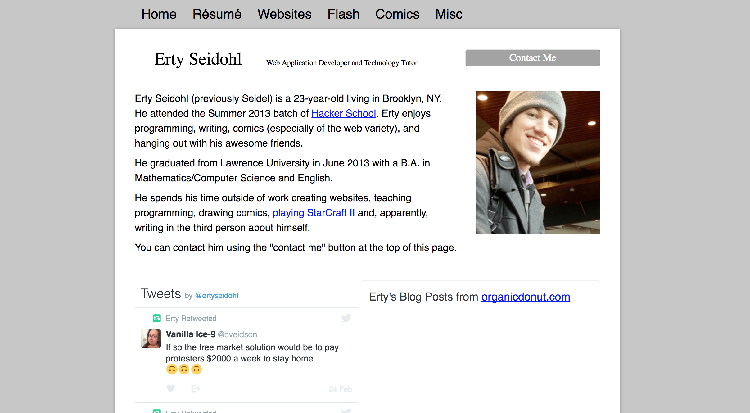 In 2014, I was working as a web developer and built a new version of the site, finally moving to erty.me, as I'd changed my name from Seidel to Seidohl. In November 2015, I updated my site again to focus on my projects and achievements. Thanks much to the Internet Archive for providing me with the very first iterations of my site, which would have otherwise been lost to time.